Blue cheese is made all over the world. The products can be made from different types of milk, most common are products produced from cow’s milk. 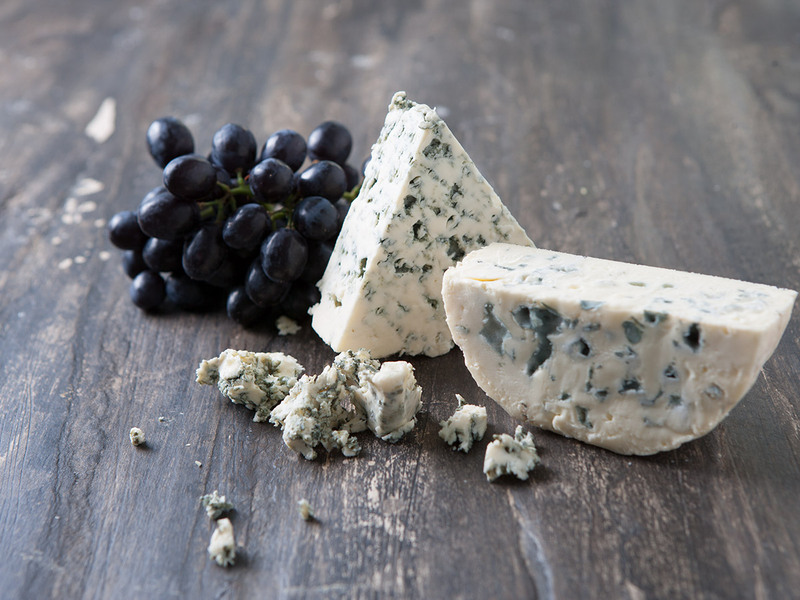 Blue cheese is produced by adding blue mould culture into the milk in the production process. Origin, milk type, milk quality, fat content, pasteurization level, place of maturation and more gives this product group very different taste, smell and texture. Combi Blue is a traditional made Danish blue where some milk fat has been substituted with vegetable fat in the production process. Danablu, Danish PDO protected – made of cow milk. 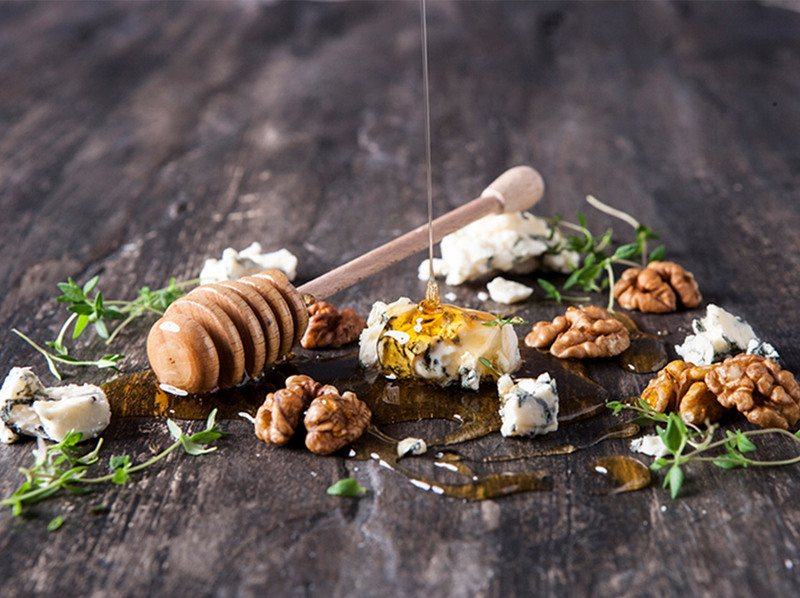 Stilton, UK – locally protected (cheese makers association) by name and tradition. Roquefort – French AOC protected – made of sheep milk. Bleu d´Auvergne, AOC French protected – made of cow milk. Gorgonzola, PDO Italian protected – made of cow milk. Danablu is one of the Danish cheeses that are covered by the PGI (Protected Geographical Indication). Hanne Nielsen of Havartigården started some experiments with blue cheese made from cow’s milk in 1874, when she made the first Danish blue cheese, inspired by the French cheese Roquefort, which she had encountered on one of her many study trips abroad. 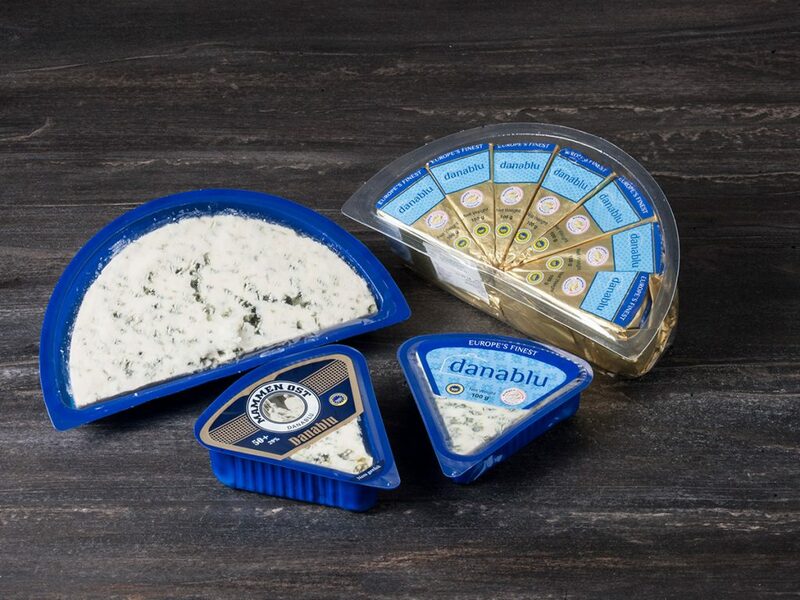 Around 40 years after Hanne Nielsen made her blue cheese, the dairyman Marius Boel created Danablu, “Danish Blue Cheese”, which is now recognized by the EU as being uniquely Danish and has the designation PGI. Tradition has it that, as a child, Marius Boel had noticed that moldy bread had a distinctive, piquant taste and that, when he was an adult dairyman, he transformed this memory into innovation. From 1914 he experimented with adding a little dried, pulverized moldy bread to fresh curd. And then, in the 1920s, he also found out how to homogenize milk, he had created an original, unique Danish blue cheese. The consistency was creamy, fat and cuttable and the taste was round, piquant and full of nuances. Visually, the cheese was characterized by a beautiful, almost regular blue-green marbling that tended to decrease towards the outer edge of the cheese. This was Danablu, “Danish Blue Cheese”, as we know it today. Danablu has since conquered the world and gained a lot of international recognition. For example, it has almost become a tradition for Danablu to win gold in its category and become the overall world champion at the cheese world championship in Wisconsin, USA. Our Danablu is produced at our Droesbro Dairy. 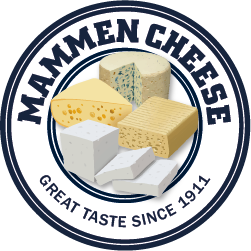 50 & 60+ fat content, cylinder or block shaped in sizes from 100g retail packs to 4kg whole cheeses. Combi Blue has its history in the Danablu. The major difference is that some of the animal milk fat has been replaced by vegetable fat to meet certain demands and customer’s requirements. Taste and appearance is very similar to traditional Danablu. Our Combi blue is produced at our Droesbro Dairy. 50+ fat content, approx. 3kg cylinder shaped wheels. Italian blue cheese, made from unskimmed cow’s milk. It can be buttery or firm, crumbly and quite salty, with a “bite” from its blue veining. Gorgonzola has reportedly been produced in the town of the same name since AD 879. Today, it’s mainly produced in the northern Italian regions of Piedmont and Lombardy. Pasteurized whole cow’s milk is used, to which starter bacteria is added, along with spores of the mould Penicillium glaucum or/and Penicillium roqueforti. During the aging process, metal rods are quickly inserted and removed, creating air channels that allow the mold spores to grow into hyphae and cause the cheese’s characteristic veining. Gorgonzola is typically aged for three to four months. The length of the aging process determines the consistency of the cheese, which gets firmer as it ripens. There are two varieties of Gorgonzola, which differ mainly in their age: Gorgonzola Dolce (also called Sweet Gorgonzola) and Gorgonzola Piccante (also called Gorgonzola Naturale, Gorgonzola Montagna, or Mountain Gorgonzola). Under Italian law, Gorgonzola enjoys Protected Geographical Status. Termed DOP in Italy, this means that it can only be produced in the provinces of Novara, Bergamo, Brescia, Como, Cremona, Cuneo, Lecco, Lodi, Milan, Pavia, Varese, Verbano-Cusio-Ossola and Ve rcelli, as well as a number of comuni in the area of Casale Monferrato (province of Alessandria). The cheese is produced in 6 or 12kg wheels. Sold in retail as 100g – 300g packages, and Foodservice 750g, 1,5kg, 3kg or 6kg.